Before Edward Tufte became very well known for his work on data visualisation, he wrote on the application of statistical methods in the social sciences. 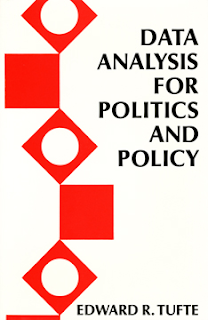 One of his best books is a slim volume published in 1974 by Prentice Hall, Data Analysis for Politics and Policy. Even if you have no interest in either Politics or Policy, this is a great book for learning about data analysis. The book was previously available to download for free from Tufte's site, but is now available there for $2 as an e-book in PDF format (HERE). Below is one of the figures from the book, which shows a data set on US death rates from motor vehicle accidents that Tufte analyses in some detail through the book. The plot shows the distribution in death rate across each of the states in the US. The graphic doesn't reach the high standards that he set himself later in his career, but it already shows a dedication to showing the data in a clear visual manner.